Jungle Beat has launched a new game. 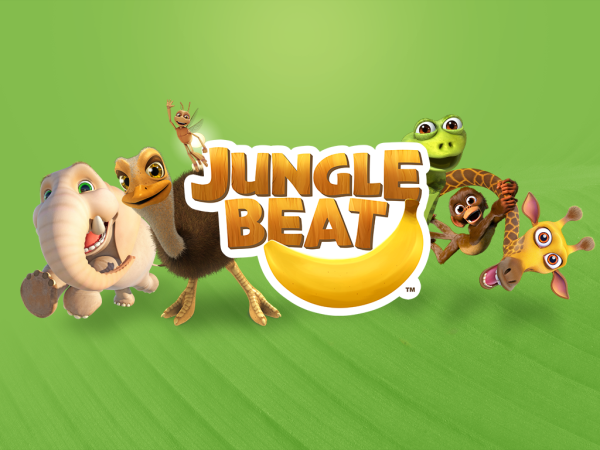 Jungle Beat recently launched new children’s game to coincide with the world premiere of the show’s third season on the Boomerang channel across Europe and soon afterwards took the top spot in the South African App Store. The award-winning nonverbal children’s animated series is produced by South Africa’s Sunrise Productions. The animals in the Jungle Beat children’s game are having the adventure of a lifetime! Baby Ostrich is lost in the jungle and her friends have to join together to rescue her using every skill at their disposal. The game features a rip-roaring rescue mission through tricky terrain, with puzzles to challenge your fingers and brain. Although aimed at children aged four to 11, the puzzle platform style format will appeal to the whole family. The animals include many amazing characters, like Firefly whose laser beams zap obstacles out of the way, and Giraffe, who takes the art of planking to a whole new level! And you can mash, crash, splash and bounce your way through 25 fun, family-friendly levels! Are you ready to move with the Jungle Beat? Jungle Beat the TV show is a fun, family-friendly series of CGI animated, self-contained episodes focusing on various animals and the bizarre situations they encounter in nature. The stories are classic family fun, with simple situations that spiral into hilarious chaos. They are also proud content partners of our very own Bongi’s Farm children’s educational app. Download the Jungle Beat game from the iTunes App and Google Play stores. You can also visit the Jungle Beat website to learn more.